Surface Chemists of Florida, US Patent No. 10,189,752, January 29, 2019. Sealant compositions containing waxes are widely used as effective moisture barriers in coating applications, particularly as sealants for controlled release fertilizers. Commercially available sealant compositions are typically thermoplastic, waxy materials that are tacky above their melting points, necessitating agitation during a cooling step. This cooling step is typically carried out in a fluid bed or a rolling drum, particularly when wax based sealants or components are used in the coating process. The cooling step adds capital costs for equipment, added space, extra mixing time, and energy costs. SCF’s most recent patent provides an effective sealant that does not require a cooling step, thereby reducing costs and simplifying the sealant process. 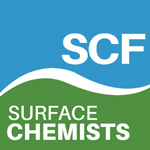 SCF has discovered and patented moisture barrier coatings and sealants comprised of mixtures of organic wax and wax soluble polymer which are dispersed into one or more components of a thermoset polymer and form a semi-interpenetrating polymer network when the thermoset polymer is subsequently applied to and cured on a substrate. The addition of the wax and wax soluble polymer substantially improves the moisture barrier properties of the thermoset polymer, and provides an effective moisture barrier coating that is non-tacky at the cure temperature of the thermoset polymer, and thus does not require a cooling step. Please contact Surface Chemists of Florida for more information. when the treated surfaces are dried. SCF’s research and development engineer, Dr. Stefan Kelly, presented his work investigating the early stages of caking in prilled ammonium nitrate this past September at the 2018 ANNA conference in Calgary, Canada. This work was aimed to provide a more fundamental study of the soft-set caking behavior in ammonium nitrate. Figure 1. Process of AN caking through saturated salt solution bridging. Ammonium Nitrate (AN) prills, like many salt powders and granules, exhibit hygroscopic behavior, meaning they readily adsorb moisture from the surrounding environment. When AN prills adsorb enough moisture a saturated salt solution forms crystal bridges to other prills that are in direct contact. Caking of prills leads to difficulties of handling and transport, even rendering products and equipment unusable. AN prills can experience caking in the presence of moisture, pressure and erratic storage conditions. An interesting caking phenomenon occurs called soft-set caking, which is different than typical caking which yields solid chucks or bricks of material. In the case of soft-set caking, the prills form a temporary cake after being stationary for a period (in railcars, trucks, silos, etc.). The temporary cake results in difficulty initiating flow, but once the cake is broken the prills flow freely, as usual, but then caking would return when sitting. In his work, Dr. Kelly adapted established industry test methods as well as created new methods to add a higher degree of quantification to the study of fertilizer caking. These test methods included a sensitive means of measuring the caking forces present in soft-set phenomena under varied caking conditions. Figure 2. 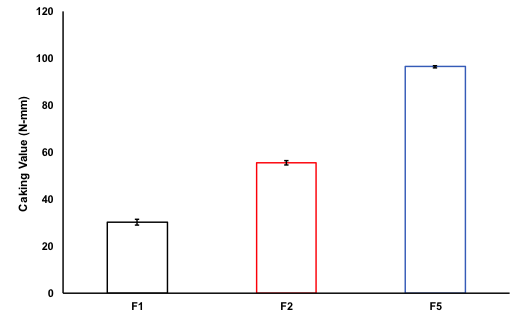 Data set showing the test method sensitivity for measuring the forces in soft-set caking. Optimum coating levels were determined that limit soft-set caking. The effect of pressure on AN prills to induce caking at various coating levels was explored. New coating formulas were examined that reduce the performance issues AN experiences when cycled through its phase transition at 32°C. Hudson, Alice, Surface Chemists of Florida, US Patent No. 9,856,436, January 2, 2018. Surface Chemists of Florida, Inc. has patented modified soy protein laundry additives that are derived from soy flour with minimal processing and waste streams, thus allowing production of economical additives that may provide soil antiredeposition, dye transfer inhibition, soil repellency, and fabric wear reduction in household and I&I laundry products. The use of renewable sources of raw materials for producing chemical materials for applications in wide ranging industrial and consumer products is important for a sustainable future. 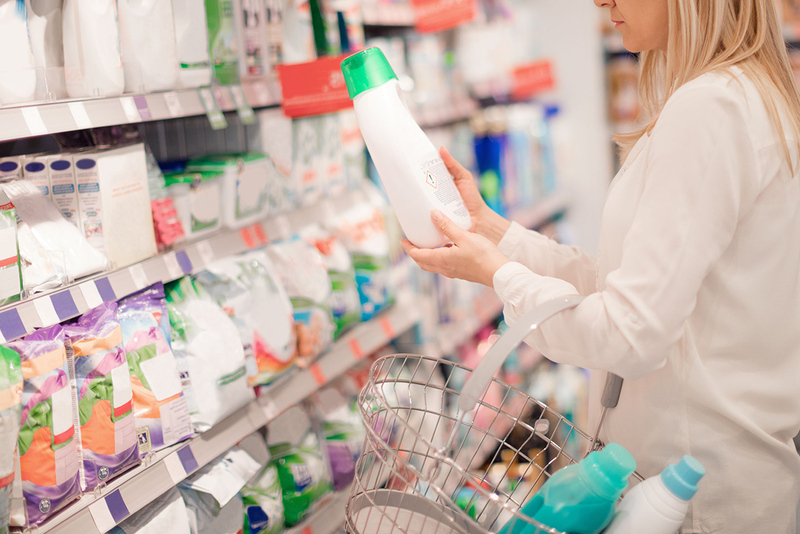 The use of naturally derived biodegradable raw materials to produce additives for use in consumer products – especially materials utilizing processes that generate minimal waste streams – greatly enhances the ongoing sustainability efforts of detergent manufacturers and supports the principles of green chemistry. There has long been a need for laundry additives that are 1) biodegradable and bio renewable, 2) produced sustainably with minimum processing steps and low waste production, 3) processed with very minimal solvent use, 4) compatible with surfactant systems commonly found in laundry products, and 5) economically effective in today’s global market. They may also prevent dye transfer from garment to garment in the wash.
Additionally, the new materials can provide soil repellency to laundered fabrics. They may provide a lubricated surface on the fabric that decreases fabric abrasion and pilling. Surface Chemists of Florida is proud to announce a significant achievement in our continuous efforts to better serve our clients. In order to expand our technical abilities and meet the increasingly challenging needs of our customers, we have doubled our operating footprint at our headquarters in Jupiter Florida. This new working space includes laboratories, offices, meeting areas, and technical development and process scale-up facilities. Offices and Meeting Space. Not only is our footprint increasing, but so is the number of SCF scientists and staff members! We have grown our team substantially and our new office and meeting spaces will allow our current and future staff members the ability to work more efficiently on project details, product manufacturing logistics, and general aspects of our growing business to better serve our customer base. Our dedication to attentive and personalized customer service will continue to expand with our growing business. Laboratory. Our new laboratory space is a dedicated specialty testing area for our physical and analytical chemistry instrumentation. This new state of the art space not only provides SCF researchers with the capacity to work systematically and proficiently on standard methods, but also the freedom to research and independently develop new products and test methods unique to individual projects specified by our customers. In addition, SCF has built a Class II laboratory to complete microbiological testing ranging from environmental population to preservative efficacy studies. Technical Development and Scale Up Facility. As our main customer industries and markets become more focused, we have expanded our capabilities to develop, fabricate, and utilize industry specific production and test equipment from lab to pilot scale. SCF’s unique chemistries and products are designed to fulfill specific ideas and issues conveyed to us by our customers in their specialized markets. SCF’s expansion has already allowed our engineers and scientists the space and instrumentation to complete a number of scale-ups and custom-developed testing protocols. SCF has been using the abundant Florida sunshine to provide electrical power for its operations since January 2012. When we expanded the facilities in 2017, we also doubled the capacity of the solar installation, and we are now producing approximately 75% of our power needs. SCF’s solar installation was motivated by a commitment to environmentally sound business practices and also by its commitment to active involvement in emerging technologies. to the real world for over 45 years! Surface Chemists is an R&D company based in the technology of surface science. We are the problem solvers – developing and commercializing unique products and processes that allow our customers to accelerate their innovation, differentiate their products, and increase the value they provide to their customers.